I just received the following regarding Sandra Bland’s mugshot… From the first time I saw the jail house photo, I noticed something was terribly wrong but I just couldn’t put my finger on it and brushed it off. After reading the following FaceBook post it made me totally sick to my stomach. If the Army didn’t teach me anything else…it taught me ATTENTION TO DETAIL. Look at this pic. 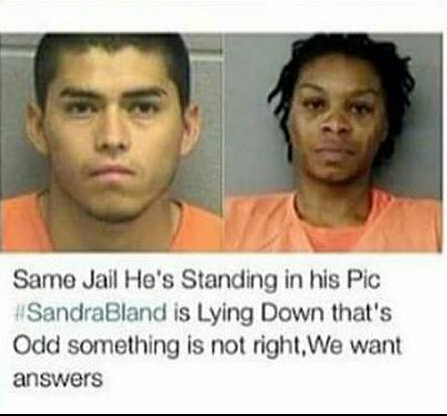 #1 Why does she already have an orange jumpsuit on in a mugshot supposedly taken during in-processing? #2…Look at her hair…her locs are pointing to the back instead of hanging straight down…which indicates that she was laying on her back, NOT standing up against a wall. #3 The fat in her face is pushed back towards her ears…another indication she was laying down. And #4, look at the right side of the pic, which is the left side of her face…it droops lower than the other side…which happens when you have lack of oxygen to the brain. So my question is…was this sista ALREADY dead in this mugshot? Thoughts…??? At 7:05 a.m. the morning of July 13, Bland told the jailer she was doing fine. About 50 minutes later, Bland used an intercom in her cell to ask how to make a phone call from the phone in her cell. She was told to use the four-digit pin she was given during booking. HOWEVER: The jail DOES NOT have a record of Sandra Bland actually making a phone call. She’s in her flowered maxi dress getting patted down, and that’s when her picture most likely was taken, not in orange jail garb. The coroner claims Bland’s system had 18 micrograms of THC per liter in her system. That’s more than three times the legal limit for drivers in Colorado and Washington, states that permit the recreational use of marijuana. 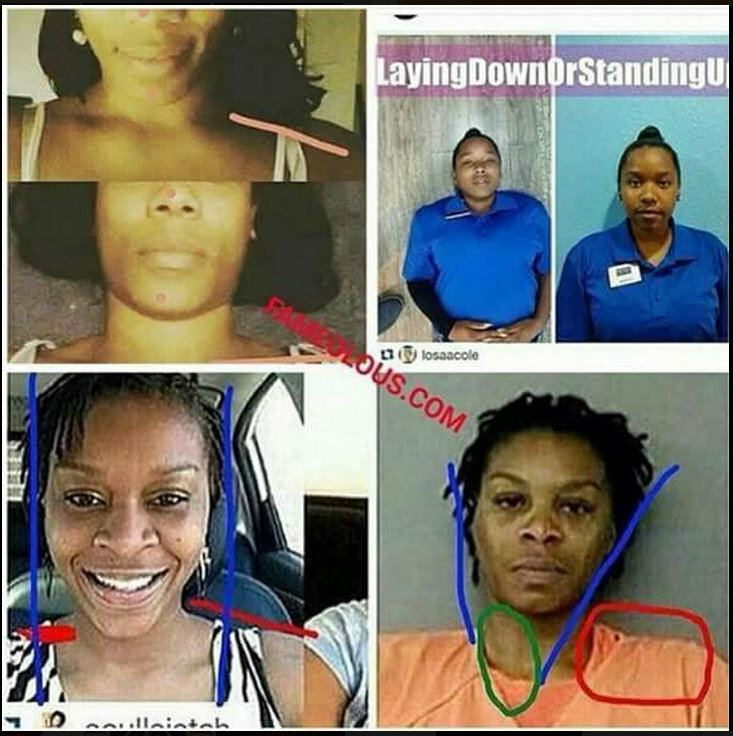 It is totally apparent in the video of her interaction with the officer Sandra Bland was NOT high…. It’s not like she lit up a joint in the cell so where did the THC come from? Someone shot her up with in after she was dead. OMG..ALL these POS are scary…the whole PD (FERGUSON ANYONE?) that’s why we should NOT have allowed the misscarraige of justice to stand in Ferguson..it sets it up for more of the same..
Apathy is the glove evil puts it’s hand into! BLACK LIVES MATTER! 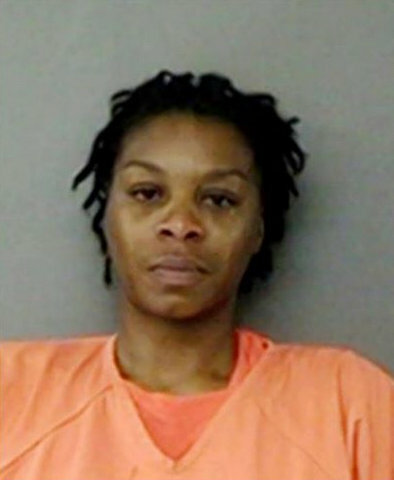 On this pic of the late Sandra Bland she has bruising on both sides of her nose and mouth running vertically down her face, and on her right side, the left as you view it she has obviously an oval bruise level with her cleft in her chin. She absolutely looks dead. 1) There is tape holding her eyes open. 2) There is tape holding her mouth shut. 4) Somebody has added in skin highlights to make her look alive.. and they are not natural to her skin at all. 5) The right pic is edited. Eyes added in, highlights put on skin, shadows put on clothes, tape edges smoothed out. 6) Grainy is natural to poor lighting and poor equipment. the smoothing in the right pic is editing in photoshop. 7) even if she was staring ahead, there should be a slight gradient to the eye color, even in that poor quality of photo. 10) They repeated the orange lighting on her shoulders to create less of a shadow, they repeated highlights on her face (light reflection) to add highlights to her face and neck, they smoothed out her complexion. if they went through all this fotoshopping effort,why didn’t they fotoshop the “sticky tape” out? mug shots don’t take the best pics,or have the best lighting,so that explains away a lot of what you have stated.in my opinion she doesn’t look deceased,and I have seen dozens&dozens of death fotos. Thanks for posting your opinion. Nonetheless I disagree with you. The sheriff goes through some detail pointing out that on the table beside her bed are sandwiches wrapped in cellophane and points out that this was her dinner she didn’t eat from Sunday night. “If she didn’t eat her breakfast, then the container wasn’t open, it should have been on the table with the sandwiches or on her bed. The video is good enough to count the number of boxes on the cart.” On the video, it shows a male officer serving inmates breakfast at 6:34am but it’s indicated Bland refused her meal. In review of cell 95, the odd oversized trash-can; during the media tour of Bland’s cell, the photo clearly shows a brown paper bag in which an untouched sandwich is still inside along with a Styrofoam cup, an opened book laying on the bed along with an unused transparent trash bag hanging off the side of the black trash can. The sheriff informed the media the janitorial service had come into the cell to replace the trash bag. If the janitorial services came in, why is the cell not cleaned up? Why are there day old sandwiches still on her nightstand? 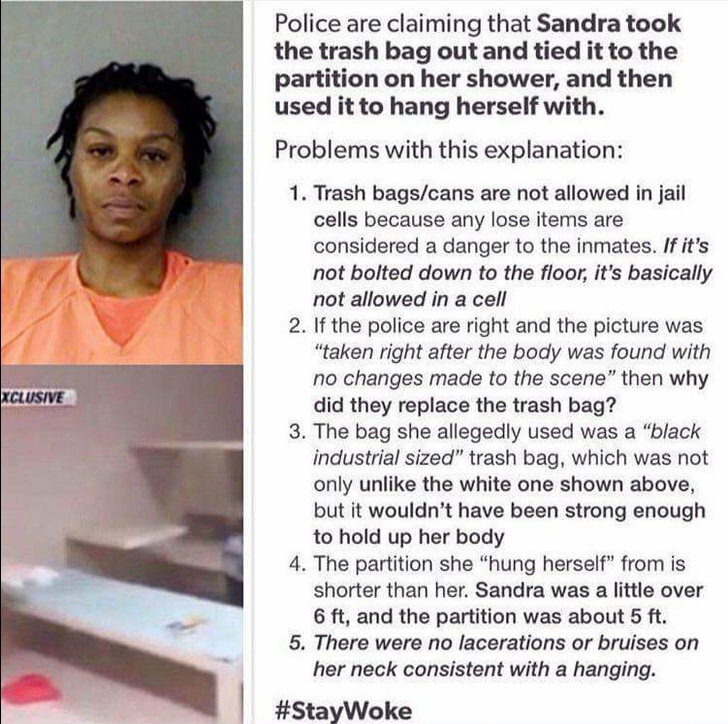 The most incriminating evidence may be the trash bag used as a ‘hanging’ tool to allegedly precipitate her death. It is she alleged she double tied the trash bag to create the ligature hanging it from the 2 inch bar supporting the privacy partition separating the toilet area within the cell. The Boy Scout signature style knot would require the skills of someone who has the ability to tie a sturdy and strong knot.